Another pitfall of an unprotected border is the connection between illegal aliens and drug violence. In Texas, at least three illegal immigrants, part of a drug gang, murdered two other illegal aliens during a drug deal gone wrong. With illegal aliens from Mexico, comes their drug crime. Why are you okay with this? The Hidalgo County Sheriff’s Office has arrested a suspect for his alleged involvement in a double homicide investigation. On Friday May 1, 2015 at approximately 7:30 p.m., the Hidalgo County Sheriff’s Office received a call for service for a vehicle on fire near FM 1015 and Nittler Rd in rural Edcouch. The vehicle was approximately 100 yards west from the roadway and on the easement of a canal bank. The Monte Alto Fire Department was dispatched to the location to extinguish the vehicle fire. Once the fire was put out, examination of the burned vehicle revealed two bodies inside the trunk area. Sheriff’s Investigators and FBI responded to the location and initiated a homicide investigation. Once jurisdiction was established, the Hidalgo County Sheriff’s Office became the lead agency handling the investigation. Hidalgo County Justice of the Peace Jesus Morales responded to the scene and ordered autopsies on both victims. Sheriff’s Investigators working on the case were able to identify the two victims as 23 year old Jose Luis Salinas Torres, and 26 year old Lazaro Alejandro Martinez Esparza. The burned vehicle was also identified as a red 2012 model Volkswagen Jetta, and property of Esparza. The autopsies revealed that the cause of death to both victims were gunshot wounds, prior to them being placed in the vehicle and burned. 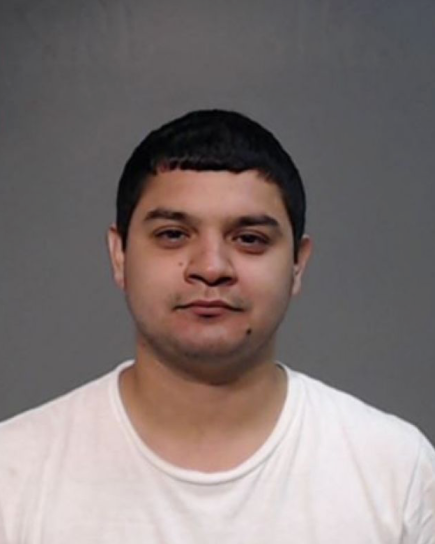 Through the course of the investigation, Sheriff’s Investigators were able to identify a suspect in the case, 22 year old Edwin Adrian Salinas, and obtain a Capital Murder warrant for his arrest. Salinas had healed burn injuries on his body when he was taken into custody, and he provided statements to Investigators implicating himself in the double murder. Investigators believe those injuries are a result of Salinas’ involvement in the burning of the victims, and that a possible motive in the case is the theft or robbery of illicit narcotics during a transaction.